아마존 각 국가별로 7월 16일은 프라임데이가 진행된다. 재작년에는 처음이라서 별볼일없었는데, 작년에는 뭔가가 좀 떴었다. 아마존 자회사인 WOOT에서도 며칠 전부터 계속 딜이 올라오고 있다. 아마존이 들썩이니까 이베이도, 라쿠텐도, 뉴에그도 들썩들썩. 매달 나오는 50달러 기프트카드 구입 시 10달러 크레딧 주는 것은 프라임 대상이더라도 적용되는 대상자가 극히 제한적이었는데, 이번에는 프라임 회원이면 누구나 적용되는 것 같다. 위 그림의 맨 아래에 있는 버튼 클릭하고 25달러 기프트카드를 구입하면(이메일로 전달되는 것을 구입할 것. 실물 기프트카드를 구입할 수도 있지만, 배대지 통해서 실물을 받을 가능성은 높지 않다.) 이틀 이내에 크레딧이 계정으로 들어오며, 그때 다른 물건 구입시 사용할 수 있다. 크레딧은 9월 2일까지 사용해야 된단다. 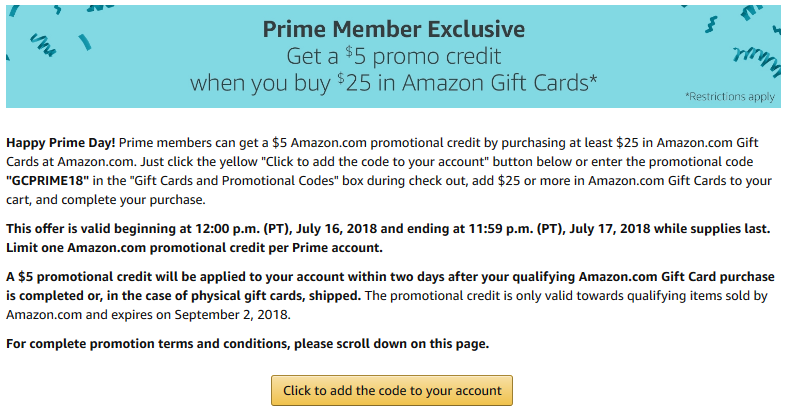 In order to qualify for the promotional credit, you must: (1) be an Amazon.com Prime member; (2) click the yellow “Click to add the code to your account” button or enter the promotional code “GCPRIME18” in the “Gift Cards and Promotional Codes” box when you check out; and (3) purchase at least $25 in qualifying Amazon.com Gift Cards in a single order at Amazon.com beginning 12:00 p.m. (PT), July 16, 2018 and ending 11:59 p.m., July 17, 2018 (PT). Amazon.com Gift Card purchases must total at least $25 in combined value, and the Amazon.com Gift Card(s) must be purchased in a single order at Amazon.com by an Amazon.com Prime member account. Amazon.com Gift Cards are subject to Terms and Conditions. Amazon.com Gift Cards purchased through Prime Now do not qualify for this promotion. Offer valid on Amazon.com Gift Cards and Amazon.com eGift Cards sold and delivered by ACI Gift Cards, LLC and purchased at Amazon.com between 12:00 p.m. (PT), July 16, 2018 and 11:59 p.m., July 17, 2018 (PT).This offer is not valid on (1) any Amazon.com Gift Cards or Amazon.com Gift Card Balance Reloads that are purchased prior to 12:00 p.m., July 16, 2018 or those purchased on July 16, 2018 but scheduled for delivery after July 17, 2018 or (2) any Amazon.com Gift Cards delivered as an Allowance to another customer’s account. The promotional credit only applies to products and digital content sold by Amazon.com or Amazon Digital Services LLC (look for “sold by Amazon.com” or “sold by Amazon Digital Services LLC” on the product or content detail page) and all eBooks made available through Amazon.com. Products and digital content (except for eBooks) sold by third-party sellers or other Amazon entities, including Prime Now LLC, will not qualify for this offer, even if “fulfilled by Amazon.com” or “Prime Eligible”. This limited time offer and associated promotional code expire at 11:59:59 PM (PT) July 17, 2018 or when supplies have been exhausted, whichever occurs first. Any promotional credit remaining unredeemed after September 2, 2018 11:59:59 PM (PT) will be forfeited.